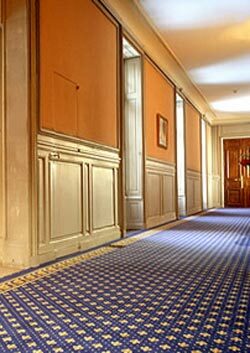 Axminster carpet is one of the basic weaves that originated in the 1700’s in the town of Axminster, England. Axminster carpets were knotted in wool on woolen warps, with wefts of flax or hemp, and featured Renaissance architectural or floral patterns. The Axminster carpet factory closed in 1835 with the advent of industrial weaving machines. The name survives as a generic term for all machine-made carpets with pile similar to velvet or chenille. Unlike the Wilton weave, almost all pile yarn appears on the surface of this carpeting. This beautifully classic, and traditional carpet is suitable for wall-to-wall applications, on stairs or even custom cut into special area rug treatments.